This article was first written and published by the Roar. The fourth edition of the Women’s Big Bash League got underway last weekend and after the results, I think it’s clear that it is going to be a very competitive season. There were upsets – most notably the Melbourne Stars defeating the Sydney Sixers by 7 wickets thanks to some tremendous bowling from Nicola Hancock who took 4-22 (including the key wicket of Ellyse Perry) – and some phenomenal batting from Lizelle Lee who scored 102 off 56 balls. That was the fourth highest score in WBBL history and the highest ever total from a Stars player. There were some stand out performances. While the Melbourne Renegades may have lost to the Sydney Thunder by 6 wickets, it was Renegades player Tayla Vlaeminck who stole the show. Despite having made her debut for the Australian Women’s Cricket Team in this year’s World T20 series, due to injury, Tayla still had not made her WBBL debut. She did so on the weekend and it was a performance to remember. Tayla took four wickets on debut and ended up with figures of 4-30. Not to be outclassed, there was also some great bowling by the Thunder, particularly Nicola Carey who dismissed Emma Inglis for 11 runs with one of the best caught and bowled I have ever seen. In other results, the Adelaide Strikers beat the heat by 36 runs and the Perth Scorchers beat the Hobart Hurricanes by 6 wickets. The Scorchers were only able to seal the win in the final over and considering that the Hurricanes only managed two wins last season and were up against a team featuring the likes of Meg Lanning, Nicole Bolton and Ellyse Villani. Additionally, the Hurricanes were also without all their international players – Smriti Mandhana, Heather Knight and Hayley Matthews. This all bodes well for a far more competitive season for the Hurricanes this year. So onto this weekend and the second big weekend happening in Sydney. This weekend over three days, each team will play two games so we should have a better idea of form when the weekend is over. If you are based in Sydney there are four games happening over three days at North Sydney Oval. On Friday night the Sixers take on the Scorchers. On Saturday the Heat will play the Scorchers followed by the Sydney derby between the Sixers and the Thunder. The Thunder and the Heat will round out the weekend with a game on Sunday afternoon. Outside of New South Wales, the Hurricanes will play the Stars in Burnie twice and the Renegades will play the Strikers in Melbourne twice. There are a couple of games I’m really looking forward to. The first is the derby between the Thunder and the Sixers. 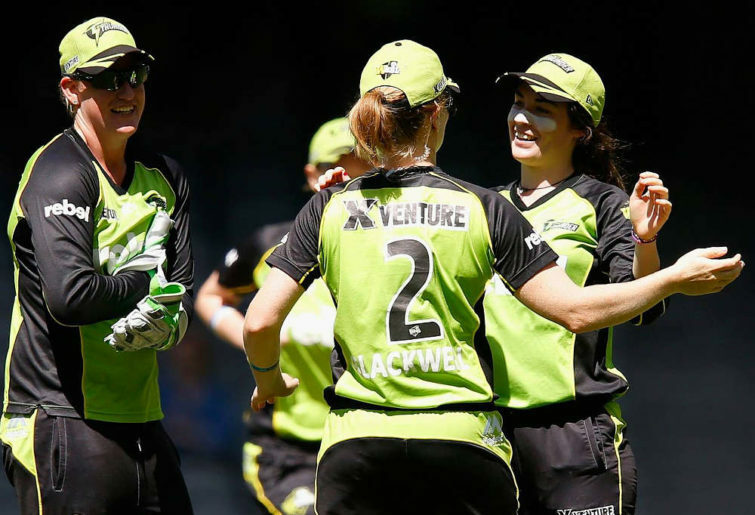 The Thunder started their WBBL04 campaign with a win over the Renegades and will be keen to back it up with a win against their cross city rivals. Much has been said about the talent in the Sixers squad – given some very clever recruiting and the decision to sign several key players to multi-year contracts, the Sixers boast the most amount of marquee players in their squad at seven including the likes of Ellyse Perry, Alyssa Healy, Dane van Niekerk, Marizanne Kapp and Ashleigh Gardner. But the Stars showed last weekend that the Sixers can be beaten. The key for the Sixers in this game will be their batting. Both Alyssa and Ellyse were in stellar form last weekend. Ellyse scored 58 runs and Alyssa scored 70 off 47 balls. With these two at the crease, I was confident that the Sixers would end up scoring more than 200 runs. But then Ashleigh Gardner got out for a duck, Erin Burns for 8, Dane van Niekerk for 2, Marizanne Kapp for a duck and Lauren Smith for 5. Sara McGlashan was the next highest scorer after the two openers and struggled to get into double digits. For the Sixers to beat the Thunder, the runs need to come from players other than Alyssa and Ellyse. This game will also be a test for the Thunder, given that they were only chasing a target of 98 last weekend. We certainly did not see the Thunder’s best batting last week against the Renegades, but I am willing to give them some leniency given just how small the total they were chasing was. I’m also exceptionally excited about seeing Harmanpreet Kaur back in black and lime green. She was in immense form during the World T20 World Cup. I particularly remember her first game against New Zealand where she scored 103 off 51 balls. That innings made her the first Indian female cricketer to score a century in T20 internationals. I’ll also be keeping a close watch on the matches between the Stars and the Hurricanes. It’s interesting that most cricket fans would have predicted that these two teams would have finished towards the bottom of the ladder. But after watching their performances during opening weekend I have no doubt that both teams are capable of making the finals. The Hurricanes will welcome some of their internationals into the fold this weekend, which will bolster their batting attack. Additionally, Nicola Hancock who was the star for the Stars last weekend, taking four wickets, will be up against her old club and will no doubt have a point to prove.